The computational facilities of the centre mainly consist of three high performance Linux PC clusters for research and teaching use. 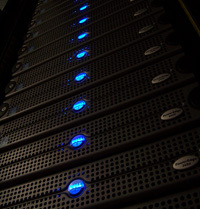 Sciblade is a cluster consists of 256 blade compute nodes. Each node has two 64-bit quad-core Intel Xeon processors. The nodes are interconnected with a 20-gigabit InfiniBand(IB) network. Hpcsim is a 64-bit Linux cluster consist of 32 cores within 16 compute nodes which is used for the research purpose. Tdgrocks is the first PC cluster of the centre. It consists of 128 cores within 64 computer nodes. It provided a learning and research facility for students from various academic institutions in Hong Kong on the subject of parallel/distributed computing.